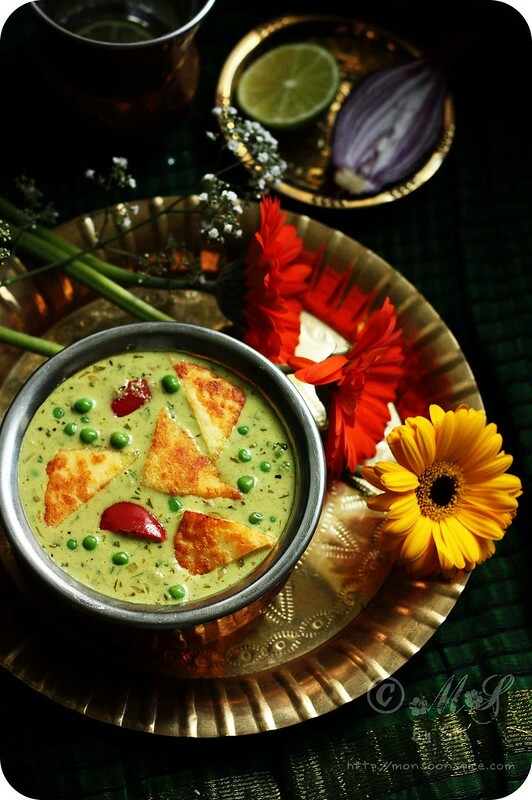 Monsoon Spice | Unveil the Magic of Spices...: Nawabi Paneer Curry Recipe | Simple Paneer and Peas Curry Recipe with Swiss Diamond Product Review and A Giveaway! 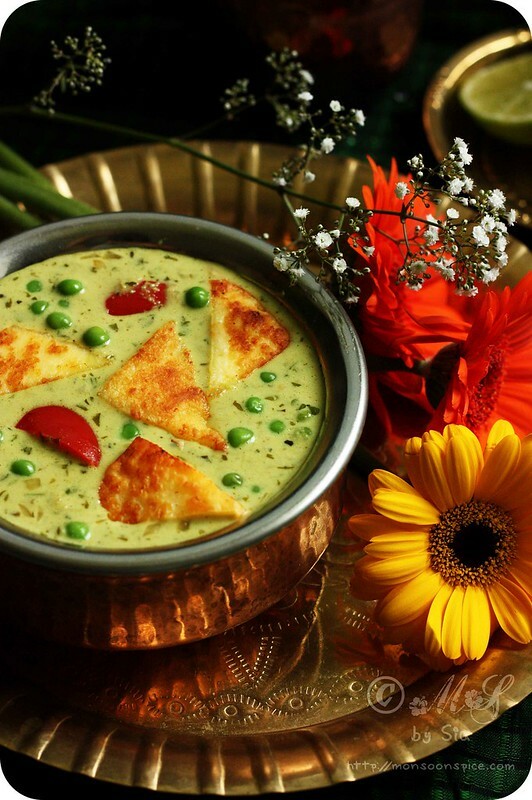 Nawabi Paneer Curry Recipe | Simple Paneer and Peas Curry Recipe with Swiss Diamond Product Review and A Giveaway! So it’s just couple of days before I hang my office wear and see myself sporting jeans and comfy t-shirts. It’s just couple of days before my stilettos are replaced with bare feet/trainers/sneakers. It’s just couple of days before my office files are replaced with story books. It’s just couple of days before my MS office calendar is wiped clean of meetings, seminars, trainings, project deadlines to colouring, learing, visits to the park, play groups, and other kid related activities. It’s just couple of days before my jovial, friendly, caring and loving boss (ahem, my hubby is my boss at office) is replaced by the most demanding, clingy, attention seeking, bossy and loving boss who will make me work 24X7 without pay, holidays and other perks! Yes, I am taking a year long unpaid sabbatical from work and will take a role of stay at home mom! Hubby even has drawn a contract letter and wants me to sign the dotted line saying I will not whine and complain as soon as he steps in and also I will not order him to come home early leaving behind all his works before 5 pm! I may be mad but not stupid! Just because I didn’t allow him to take sabbatical to be with Lil Dumpling doesn’t mean that he can come up with such silly ideas! :) Did I say that I have no plans of signing the contract or agreeing to whatever he says?! Psst… Let’s keep it between us, shall we? Among all that excitement and happy thoughts about getting to spend all that time with Lil Dumpling lurks this nagging bit of nervousness and doubt like some most annoying, unwanted guests in our life! As much as I am bubbling up with excitement at the prospect of having the chance to relive my childhood through Lil Dumpling, I am getting little anxious about loosing my interest in my current job I like and the routine I have set for myself. I think I will miss getting up in the morning, dressing up to work, and spending time in adult company and not talking about potty training, day care woes and other such things. But when I thought about it more and deeply, I realised that my anxiety is actually born due to my fear of unable to keep Lil Dumpling entertained and busy throughout the day! Lil Dumpling is at a stage where his curiosity level is at the peak with him wanting to know every single thing that comes on his way and I am not sure if I have right answers to satiate his curiosity! With unpredictable weather, I find it difficult to take him out every day to get some fresh air in his lungs! Oh, there are many such things that make me sort of nervous and I fear that I may not be able to keep him as active as they do in his day care! I guess I have to take a deep breath and keep my spirits up and take everything in a stride! Only time will tell how I cope with this new role of stay at home for one super active, curious and lovable kid that I am blessed with! My only wish is I don’t end up regretting for the decision I am taking in a hope to make my little one a very happy kid! With all this fear and anxiety popping their ugly head once in a while, we decided to celebrate Lil Dumpling’s 3rd birthday with few close friends. I took a mammoth task of cooking for 15 people which I have never done before! So understandably I was a walking and talking bundle of nerves for the week before the party. It took me a week long to decide on the full party menu and then a weekend to source all the ingredients needed for cooking. One thing I was sure to cook for my guest was a very rich Paneer dish which everyone likes. At first I thought of making either Kadai Paneer or Matar Paneer, but finally settled for cooking Nawabi Paneer Curry inspired by the recipe by Mallika Badrinath’s cookbook 100 Vegetarian Gravies. I made this Nawabi Paneer Curry with other 3 curries; Rhengan Reveya, Chole Masala, and Bombay Bataka/Potatoes and served them with Peas Pulao and Garlic Naan. For starters I decided to cook assorted vegetable pakodas (cauliflower and bell pepper fritters), Punjabi Samosa and Stuffed Bell Pepper/Capsicum Pakodas which I will be posting the recipe soon. Our friend Julie brought along delicious Vegetable Puffs to add to the list of starters. For desserts, I cooked a batch of delicious and melt in mouth Mango Panna Cotta (recipe will follow shortly) and thick and creamy Carrot Kheer/Payasam. Nawabi Paneer Curry ~ Sinfully delicious! Only problem I had with cooking for 15 people was I didn’t own many pots and pans large enough to cook for so many people in bulk! And with so much sautéing and frying that goes with Indian cuisine, I was worried that I may end up burning a dish or two while multi-tasking! But as if luck was on my side, I received an email from Remy from Swiss Diamond asking me if I am interested in testing their non-stick cookware of my choice and reviewing it?! After exchanging few emails to and fro, I finally decided to test their 36 inch non-stick wok with lid. The product was delivered to my office and it drew some attention from my colleagues who wanted to know what was in that HUGE box sitting on my desk when I came back after lunch break! Yes, the product was very well packed in a 2 and half feet square cardboard box with enough soft packaging to avoid any damage while shipping from their Luxemburg warehouse. I was impressed with the care they had taken with packaging, but they could have used little smaller cardboard box as half the box was empty when I opened it. It was difficult for me to carry it all the way to our car park which is some quarter mile from my office building! Once home, I opened the package and found this beautifully crafted wok with a glass lid (with adjustable steam vent for advanced moisture control) and a tempura rack to drain oil from deep fried foods. It is 14 inch wide and both the wok and the glass lid are quite heavy. The wok is well crafted with heavy duty cast-aluminium body. It is not flimsy or thin like other non-stick woks I own, and also it doesn’t require any special oven ring as it has perfectly flat cast aluminium base with sloped sides and hence the heat is equally distributed and will never tip or spin. When it came to cooking, I found the product really excellent! Swiss Diamond product boasts patented non-stick coating, reinforced with real diamond particles which allow oil-free cooking. I just used a teaspoon of oil to test the product by making our most favourite dish Aloo-Gobi which requires stir frying the potatoes and cauliflowers at high flame with spices. I usually end up with some burnt pieces of vegetables sticking to the bottom of the pan, no matter how fast I keep stirring them. And there are times when the vegetables kind of get breaks and mashed up after stirring them continuously for so long. But this was not the case with Swiss Diamond wok. The vegetables were evenly cooked and the potatoes and cauliflower florets had nice, crispy bite to them with the spices evenly coated. And none, yes not even one, vegetable was stuck to the pan!!! After transferring the cooked food to the serving dish, I found the wok to be ridiculously clean as if it was washed already! The use and care is really simple! There was no soaking with warm soapy water required to loosen up the burnt food stuck to the pan nor was scrubbing necessary! I just let the wok to come to room temperature before gently cleaning it with just warm soapy water and sponge. At almost £170, it is definitely one of the most expensive pieces of cookware I own, but I feel that it is worth every penny! It is well crafted, well designed, heavy-duty product with real diamond particles in non-stick coating. They sure look durable and are also oven safe up to a temperature of 260 deg C and are suitable for both gas and electric cook tops! Swiss Diamond also sells specially designed products for induction top cooking. You can read more about them and their products here. UPDATE: We have a winner! 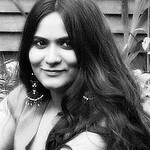 Congratulations, Vidya :) Please email me your UK shipping address at siakrishna(at)gmail(dot)com as soon as possible. Thank you all for participating in the giveaway. 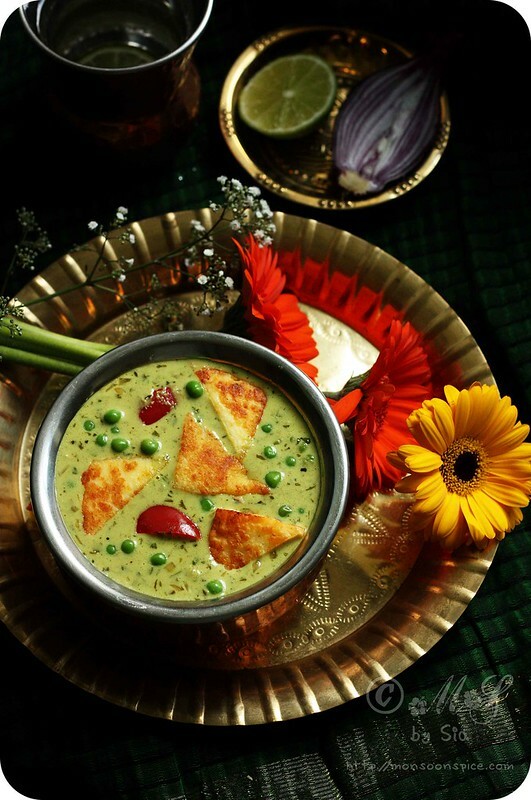 Coming back to the recipe of Nawabi Paneer Curry, the shallow fried soft paneer pieces with green peas cooked in a rich coconut and cashew nut based gravy from the Hyderabadi royal kitchens of the Nawabs seduced me enough to include it in our menu. I made few tweaks to the recipes by adding bell peppers and also grinding the green chillies and cashew nuts along with the coconut and whole spices. The final result was one rich, creamy, calorie laden, very high in fat but absolutely delicious Nawabi Paneer Curry that won many hearts at the birthday party. Lil Dumpling loved every spoonful of this Nawabi Paneer Curry with Peas Pulao. 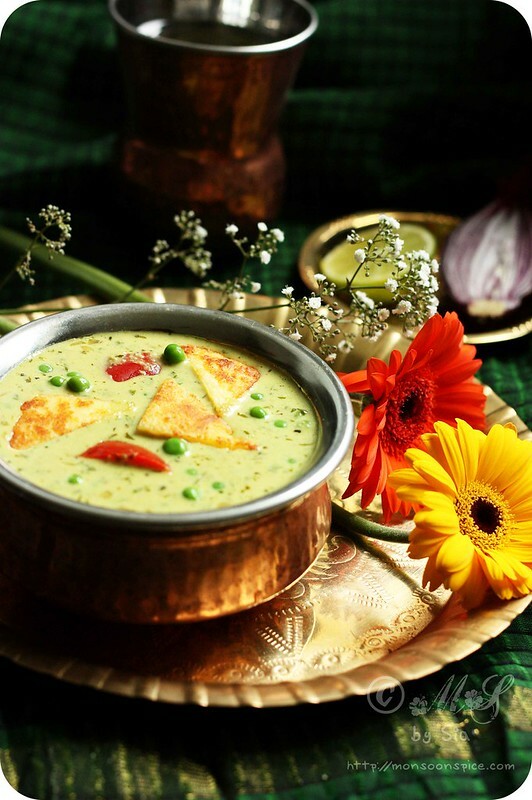 Overall, this Nawabi Paneer Curry is fit for royals, and as we Indians like to treat our guests like royals this is the perfect dish to serve at any party and impress the crowd! Drain all the water from soaked cashew nuts and mix them with all other ingredients listed under coconut-cashew nut paste. Grind everything to smooth paste by adding very little water at time. Make sure that there are no lumps formed. Keep it aside until needed. 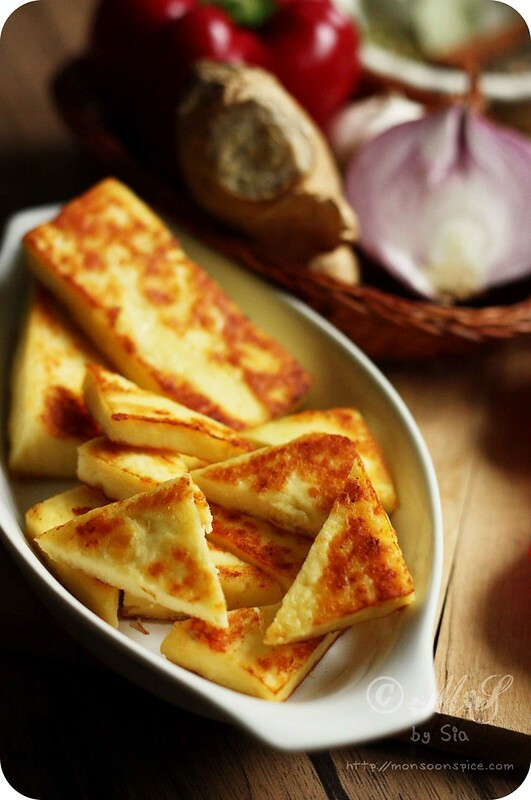 Heat 2 tbsp of oil or ghee in a pan and shallow fry paneer pieces till they turn golden brown on both sides. Keep the fried paneer pieces in a large bowl of hot water until needed. This helps in keeping the paneer pieces soft. In a same pan add a tbsp of oil or ghee and mix in very finely chopped onions. Fry them on a medium flame until they turn golden brown, about 3-4 minutes, on medium flame. Mix in ginger-garlic paste and bay leaf and fry them till the raw smell of ginger and garlic disappears and the onions are nicely caramelised, about 2 minutes. Next add the ground coconut-cashew nut paste and turmeric powder and fry it for 3-4 minutes on medium flame till the oil separates. Now add the coconut milk, finely chopped coriander leaves and salt to taste. Reduce the heat to simmer and let the gravy come to gentle boil, about 6-8 minutes. 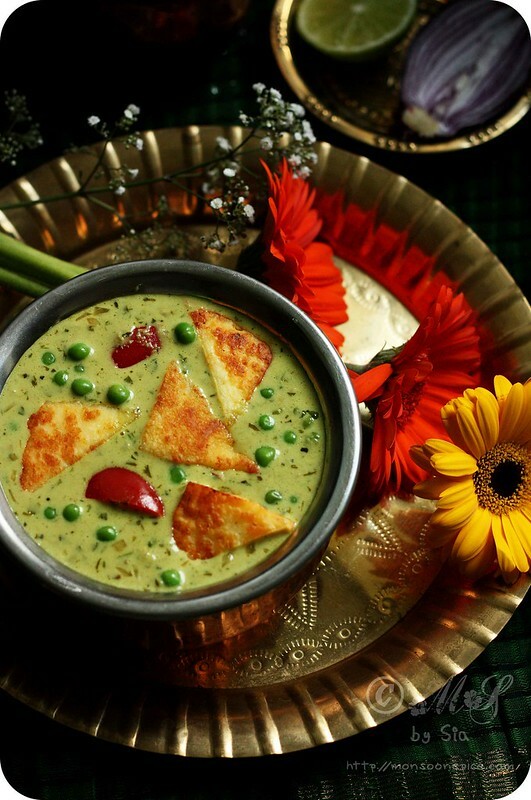 Add shallow fried paneer pieces, green peas and bell pepper and adjust the seasonings. Add about a cup or more of water to get desired consistency of the gravy. Let the curry simmer for about 10 minutes for all the flavours to blend well. 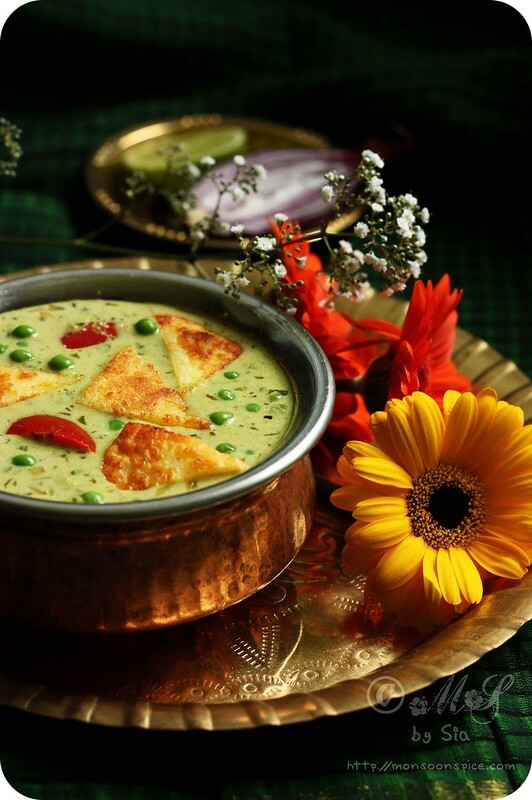 Serve this absolutely delicious, creamy Nawabi Paneer Curry fit for the royals with any Indian flat breads (Whole Wheat Naan or Butter Naan or with any stuffed parathas) or plain/flavoured Basmati rice. It tastes even better on the next day. 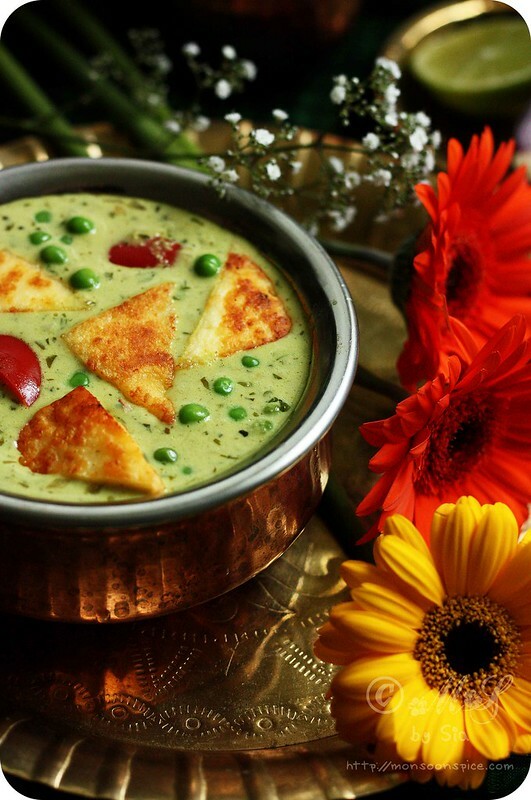 Vegans can substitute Paneer with firm tofu for equally delicious treat. You can even skip shallow frying the tofu and can directly add it to the gravy as mentioned in the cooking instruction above. 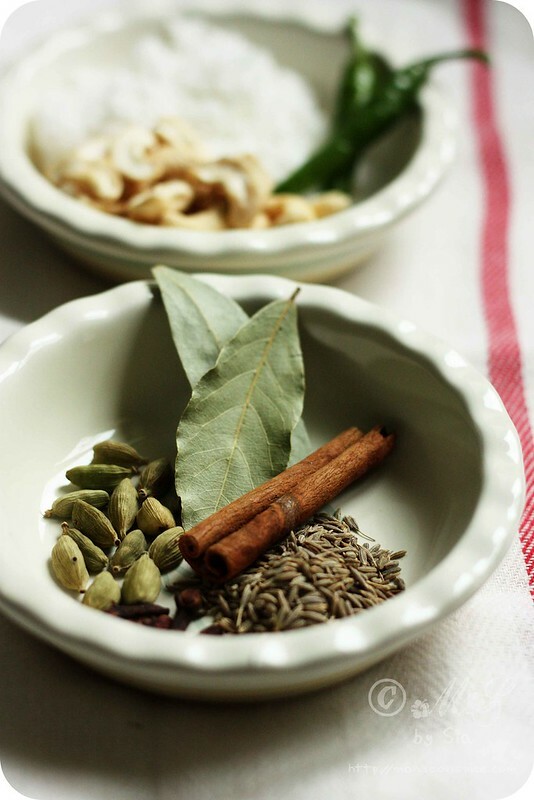 You can also add a tsp of Garam Masala or Kitchen King Masala just 5 minutes before you switch off the flame. Soaking cashews in hot water for couple of minutes helps in grinding them to smooth paste without forming any lumps. Addition of bell pepper is optional and it is not used in an original recipe. 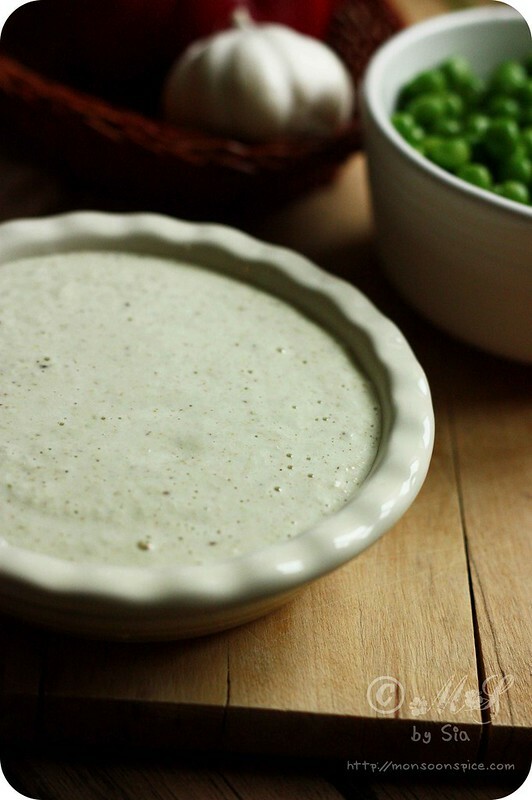 I like the little peppery, smoky flavour it adds to the gravy. good to know u are taking a break ! bookmarked this recipe :) Photos are stunning ! i will try and let u know ! Great one ! I'm unable to cook this recipe as I can't seem to handle heavy cream (or any high in fat/calorie meals) but I would love to be participate in the giveaway. I often cook and introduce Korean food to my friends but don't have enough pots or pans either. Especially high quality ones! Wow.. I really love a giveaway.. I really hate it wen the food sticks to the pan.. 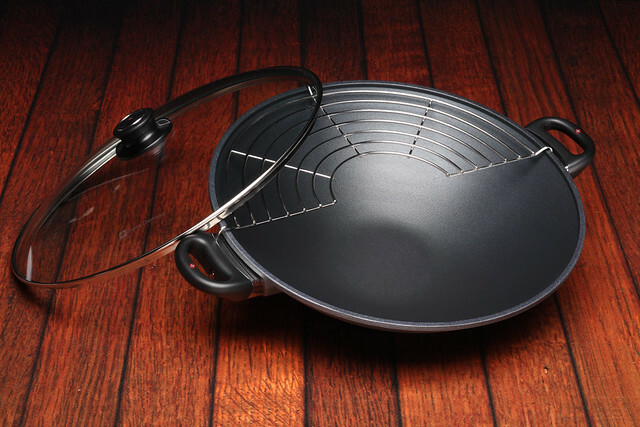 Since am a newly wed and new to cooking I could really use this non stick wok.. This curry looks incredibly good and refined! A great pan. I bought a cast-iron wok lately and I'm really happy with it. Liked the clarity of the pictures and any nawabi dish is a welcome in our house. Enjoy the time with your kiddo, really the time will fly. It is tough at times to be doing something which is a thankless job but hey, it will paid for well when kids grow up. And whining to your hubby, never let him loose,,,I wouldn't;))..
Wow, browsing through your post while viewing all these photos is sheer pleasure to the eyes. Amazing is the word I would use for it. I am happy to just stumble on this blog. Keep posting good stuff. Cheers! Nd the Dish looks Creamy and Super! 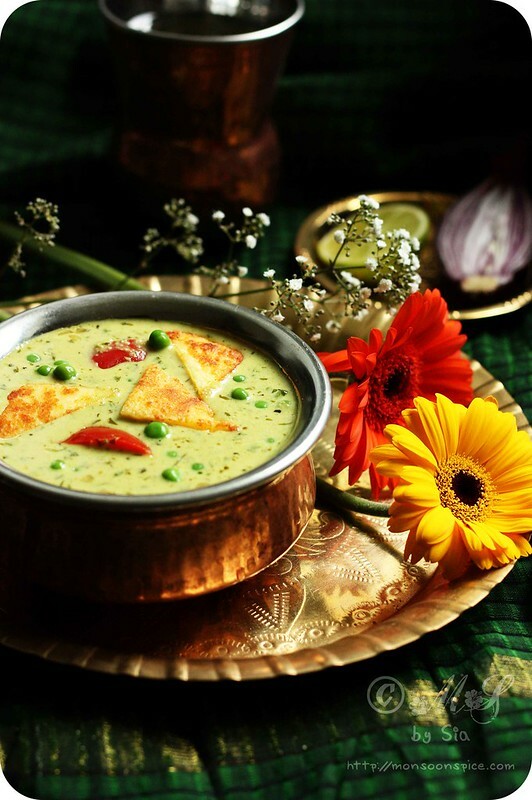 delicious yummy and creamy curry. I think taking a break from work to be with your little one is a very good decision :) I have done it twice and not regretted it! 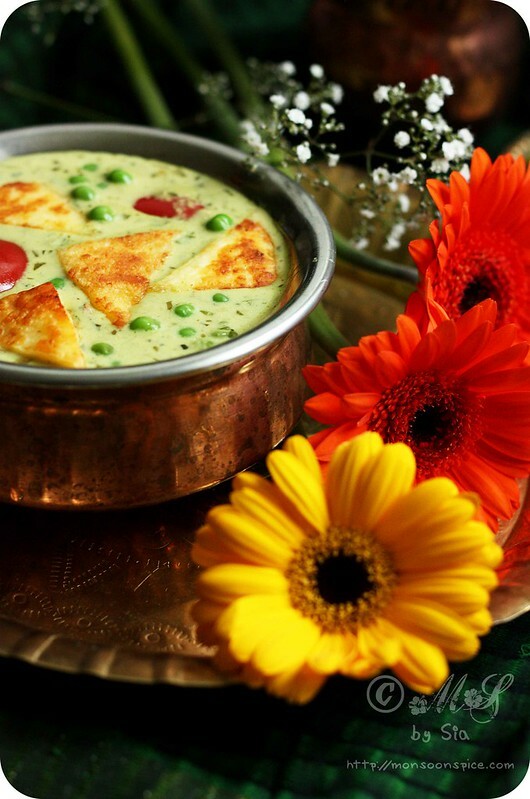 Your shahi paneer looks really good. The wok is amazing! Now if only I lived in the UK! Jokes apart, I really wish you a fantastic year ahead..enjoy every moment of your little one growing up. I started blogging in order to capture these moments..but I was a bit late..
but still....i try to put all interesting events in my blog...hoping that some of them will make him smile when he grows up! 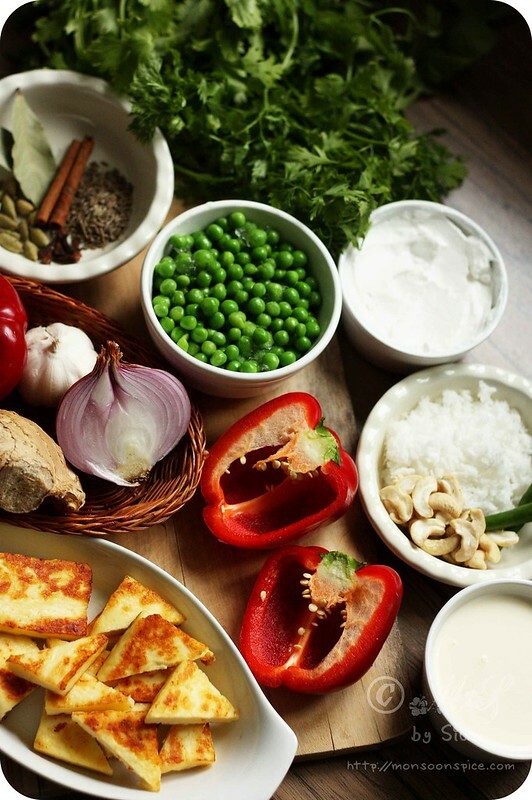 Hi sia, I am Madhu from huddersfield, came across ur food blog accidentally while searching for some recipes,you have a very good collection here and the presentation is amazing, keep up ur good work. Hi Sia, would love to be entered into the draw - it might take more than a good pan to make my food as good as yours but I'll die trying! This is a great recipe. Sounds so rich and lovely and I'm pleased it is not as complicated as I thought it would be from the look of it. I’ll certainly try this out. I'd love to participate in the give-away, so count me in! Good luck with your sabbatical to be a full time mum.... b’cos it IS a big job with no holidays! Sia the clicks are awesome....I would love to participate in the giveaway and have already liked the "Swiss Diamonds" Facebook Page. Hi Sia Great decision one you will not regret as their childhood is one you will not get back. Enjoy ur year off . Love the pics n ur recipes -they are unique and make me want to try them all. A new wok will be all the more exciting to cook ur recipes. Hi Sia great decision one u will not regret . Your recipes are so unique and yummy. Would love to be entered in the giveaway.thanks in advance n Best wishes! Wonderful recipe and the wok simply looks fantastic! I would like to participate in the Swiss Diamond Giveaway! Please Count me in for the giveaway,would love to have another new addition to my kitchen. Hi Supps!! Commenting first time on ur blog.. U have an amazing blog!! Wud love to enter in the giveaway!! curry looks super delicious! I would love to enter the giveaway! Great blog name and amazing blog. Following you now. love to try many of your recipes - but just a suggestion in order to make them more reader-friendly/user-friendly: is it possible to put the actual recipe at the TOP of the post (maybe immediately after the picture?) that way one does not have to scroll to tons of text trying to find exactly where the recipe begins. i don't mean any offense, but i have zero interest in reading about little duckling and such, and i am sure like many other readers, am just in a hurry to get to the recipe. so it will be more helpful to many of us if you place it at the top. thanks for all the nice recipes! That was one great reply to Roshni's comment. Though each one is entitled to their opinions, as a mother of toddler myself, I felt the comment by roshni very hurting where she said " I have zero interest in reading about little duckling or such". I would hate someone saying that way about my kid. Awesome blog Sia! I am one of those third set of people who come here to read about the preamble, history of each recipe of yours. I think that's what makes your blog so special. Keep up this style, please! That's one creamy paneer curry, surely have to give it a try.Since I don't live in the UK am not taking part in the giveaway. I have tried this recipe and its too good. Thanks for the lovely recipe. The dish has been tried and tested by me. Its indeed yummy and as a person who cooks frequently for minimum 15 - 20 people in UK I would love to take part in the give away and have a bigger pan. I am a regular visitor to your wonderful blog. I am highly impressed by the way you write about your life, your little child and about recipes. It takes considerable time and effort to do so. Keep up the good work and don't ever get bogged down by nasty comments. I live in the UK and will like to take part in the giveaway. I would like to participate in the product give away so please count me in. Prepared this dish for lunch today and it turned out very tasty .. My husband could not stop appreciating :) thank you for sharing the recipe. I would like to participate in the product give away so, count me in please. First time commenting on here - sorry to gush but I LOVE your blog and your recipes. It's really brave and also generous of you to put so much of your life and your time into this, so we, your lucky readers, can learn more about food and be entertained by your stories. Would like to enter the giveaway too... am desperately in need of new cookware! Love the recipes on the blog. The last one I tried was Aloo Chole Chaat. Yum! Do put me down for the giveaway. A pan that doesn't need scrubbing is pure genius! You are entitled to your comment but I am sorry, are you for real??! What a rude, insensitive and appalling comment on someone's private blog where she makes an effort to share her recipes and life, juggling so many roles together. It takes a few seconds to scroll down to the recipe and even then, the recipe is clearly demarcated. Sia...looove your blog (and the recipes) and I always look forward to your posts in my inbox. Keep it up! Hi..I had a question about the bell pepper..were they saute'd before u added them along with panneer and peas ? @Divya Dayal, there is no sauteeing/frying the bell peppers. 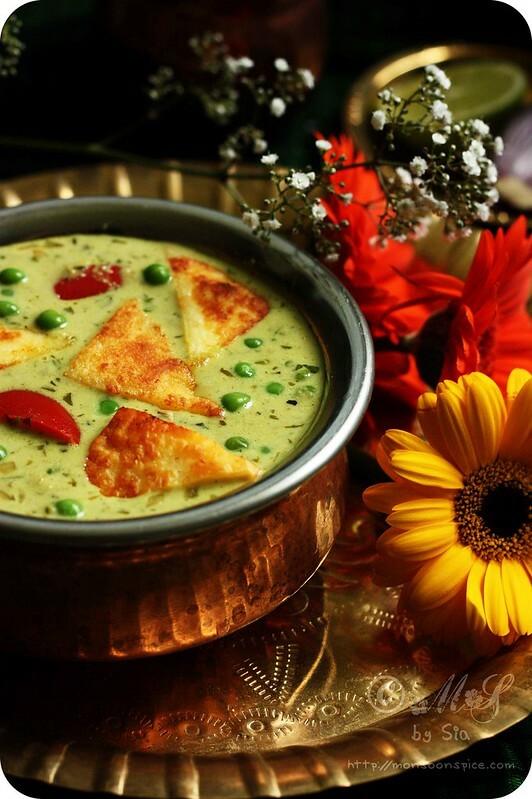 just follow the recipe and add them along with peas and paneer as it takes very little time for cooking them also they should retain their crunch in this recipe. I want to make this for around 15 people...Is it ok if i double all ingredients including coconut milk? Yes, doubling the ingredients will do the trick. Just make sure that you adjust the spices as per taste. This curry is on a heavy/indulgent side and if you are serving with other curries, you may end up with some leftovers. Thanks for the quick reply Sia. Will surely try out as mentioned. But, already I see two cups of coconut milk. Doubling may cause to have four cups. Is that not too much in quantity? this recipe will serve for 6-8 people along with another side dish. If you are cooking more than 2 side dishes, then just increase the amount by 1/2 part (3 cups of coconut milk in place of 2 cups etc). And if you are cooking just 2 side dishes, then I do recommend that you double the quantity. I have cooked this dish for 15-18 people and had to double the quantity of the ingredients. Hope this helps. P.S: The leftovers taste really good and you can store them in fridge for 2-3 days. Hi, I made this recipe over the weekend. FABULOUS!!! Thank you so much. It was very easy to follow and to re-create. I'm looking forward to enjoying again this evening as there's left overs enough for a further evenings dining. OH my goodness, I'm salivating as I type, so looking forward to tonight's supper!! Thank you again for such a delicious share.